Description: Wicked Lit returns with another Halloween's worth of horrifying theatrical productions based on classic literature by authors Charles Dickens, H.P. Lovecraft, Edgar Allan Poe, Robert Louis Stevenson, M.R. James, and Mark Twain. This year,for the first time, Wicked lit offers 6 adaptations: two sets of three stories. Production A recreates last years trio of terror: "The Cask of Amontillado," "The Unnameable," and "The Chimes." Production B offers three new ghastly tales: "The Body Snatcher," "Casting the Runes," and "A Ghost Story." Production A offers 12 performances running from October 21through November 5 (no performances on October 24-26 and November 1). Production B consists of 10 performances running from October 27 through November 6 (no performance on November 1). Times: All performances will begin promptly at 8:00 p.m.
Tickets range from $39-60, see website for details. THIS PRODUCTION IS MEANT TO BE SCARY! SEATING IS LIMITED – THESE SHOWS WILL SELL OUT! There is ample free parking on the grounds. Please consult a map before driving to Mausoleum, and do not enter from Fair Oaks Avenue - you will get lost. Journey to the catacombs for a stirring retelling of Poe’s classic tale of madness, unrequited love, and deception. Two men – one a dealer in ancient artifacts, the other a follower of the occult – enter a graveyard on an ominous evening. If all goes according to plan, only one will return home. In the spirit of A Christmas Carol (but with the bite of a horror story), The Chimes is a haunting tale of renewal, goblins, and the ties that bind. In Nineteenth Century Scotland, Mary Fettes plans to become the first female medical student at the University of Edinburgh – but horrors await that will change her forever. A publisher rejects a manuscript from a proclaimed practitioner of the occult, unleashing a supernatural fury that threatens to take his life -- unless he can reverse the spell. A college student finds himself with two flat tires and nowhere to go but an old, creaky, abandoned hotel. Hilarity ensues. LOS ANGELES, CA – Unbound Productions Co-Artistic Directors Jonathan Josephson, Paul Millet, and Jeff G. Rack have announced the line-up for two full productions of the popular horror story adaptation series WICKED LIT that will take place at Mountain View Mausoleum and Cemetery in Altadena, California. Production A (October 21-November 5, 2011) will consist of a remount of three plays that the theatre company produced as part of last year’s engagement: Charles Dickens’ The Chimes, H.P. 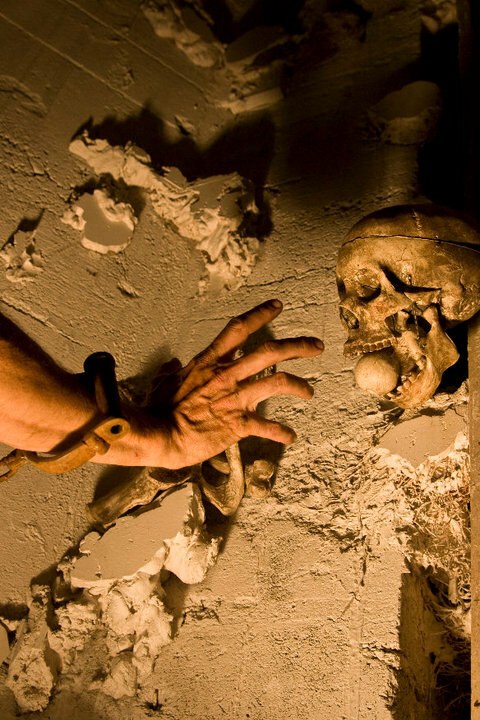 Lovecraft’s The Unnamable and Edgar Allan Poe’s The Cask of Amontillado. Production B (October 27-November 6, 2011) will include three WICKED LIT plays that have never been staged before at Mountain View: Robert Louis Stevenson’s The Body Snatcher, M.R. James’ Casting the Runes, and Mark Twain’s A Ghost Story. Josephson, Rack, and Millet have written and will direct all six adaptations. Visit wickedlit.org for complete pricing and scheduling details. WICKED LIT is also on Facebook. In 2009, the WICKED LIT production (comprised of Robert E. Howard’s Pigeons from Hell, Edgar Allan Poe’s The Fall of the House of Usher, and Washington Irving’s The Legend of Sleepy Hollow) ran for 5 performances at Greystone Mansion; last year’s incarnation of WICKED LIT received 10 performances at Mountain View Mausoleum and Cemetery; and earlier in 2011, a special WICKED LIT engagement of A Ghost Story was mounted at the Los Angeles Millennium Biltmore Hotel at the same time as the Theatre Communications Group National Conference. All performances of all productions have sold out. WICKED LIT audiences will experience three short plays as they are led through the grounds of the mausoleum and cemetery by a Storyguide. Separate tickets will give patrons access to either Production A (The Chimes, The Unnamable and The Cask of Amontillado) or Production B (The Body Snatcher, Casting the Runes, and A Ghost Story). This is a walking show – patrons must be able to comfortably walk a minimum of 1,000 paces and climb stairs in order to experience these productions. Click here for more Halloween Tours, Performances & Exhibitions.